457 Visas – The Trump effect. 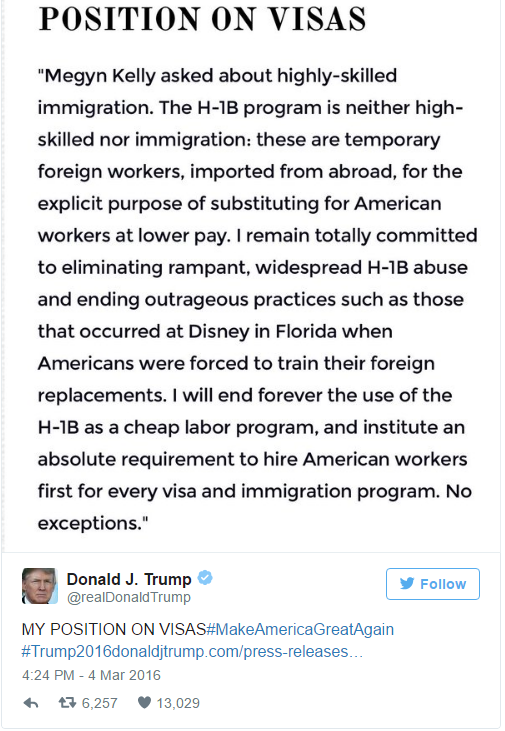 The article also displayed the following screenshot of Trump’s thoughts on the skilled immigration issue just over a year ago. Australia has a similar visa for apparent “high skilled” temporary immigrant workers – the 457 visa system. I say apparent due to the following headline which I chanced across this morning. Fast food chains banned from using 457 visas. Immigration Minister Peter Dutton is scrapping a former Labor government’s deal that allowed major fast food outlets to import staff on 457 visas. McDonalds, Hungry Jack’s and KFC will be barred from sponsoring foreign workers on 457 visas, which are intended to fill temporary skill shortages. For many people of my generation a job at McDonalds or KFC was our first step into the workforce. I got a job at McDonalds when I was seventeen and I learned to be punctual, to be polite, to work in a team, and to respond to minor crises. I volunteered for the early delivery shift and I used a forklift to unload the food truck and stack the pallets in the small loading dock. I was promoted to running the pass on busy shifts, and believe me when I tell you that Town Hall McDonalds in Perth back in the late eighties was as busy as it could get. So I must have missed the memo that described fast food workers as being skilled. I was skilled when I left that job but I wasn’t skilled when they first hired me. Which is kind of the point. These jobs are entry level positions for young people to begin their careers in the workforce, and as such they are highly valuable. That the previous Labor government, which supposedly is the party of the working class, would have signed such a deal is not surprising. As those of us on the alt right have been fond of saying for a while, it is no longer a battle of left versus right in politics. It is now a battle of globalists versus nationalists. And as a nationalist I find it inconceivable that an Australian government would willingly sign away these low skilled jobs to temporary foreign workers. Unless the same government desired to transform Australia into a nation of welfare robots dependent on government. I suspect that the Liberal government and Immigration Minister Peter Dutton have discovered some semblance of spine in President Trump’s recent example. But we need to go further. As long as there are Australians out of work, whether skilled or unskilled, then there should be no reason for Australian employers to utilize the 457 visa system. A common complaint from employers is that Australian workers’ expectations when it comes to salary are too high. That may have something to do with the extremely high cost of living in this country as opposed to other parts of the world. My monthly rent when I lived in Italy was less than one tenth of what I pay here in Australia. But passing off high wage levels as an excuse just creates a vicious circle which becomes a self-fulling prophecy as firms become addicted to the low wages they can pay overseas workers. I also find it hard to believe that Australians are demanding such high incomes when you consider how many graduates are forced to work as baristas just to pay the rent. In any case I suspect that demand for fast food jobs would skyrocket if the unemployment benefit system was competently overhauled. Young Australians in general don’t work because they don’t need to work. While young people are expected to lack a certain degree of foresight and common sense it is instead a damning indictment of our leaders that they would sign away the skill levels of future generations in this way. Two podcast episodes for you to disagree with. Buy off the unions with some fig-leaf of a training program for local losers. Put a cheery on top in the form of a iconic Aussie cricketer to give it a stamp of approval. They would have got some traction if they hadn’t timed it for the turn down in the mining industry, but I did think at the time there would be a breaking point when people started seeing through it for what it really was. As a Kiwi I’m always a guest in Aussie, but even I could see through this one. On top of that, when the work turned, I left, any of these people who have scammed their way in on the 457’s I will bet are still there. The great mistake was abandoning the White Australia policy. As to the Snowy Mountains Scheme, it seems to me this could have been completed without immigrant labour. A country is its culture, and it is people who create and embody that culture. Diversity destroys culture, and ipso facto national unity. It is pathological, a plaything of twisted politicians (and aren’t they all?). Have you ever seen one of those dreadful films where – at the conclusion (and the conclusion of some needless war) – a greaseball with an Italian or Spanish accent, says: ‘Hey, English, you are all right!’ Probably the work of some Hollywood communist. I have thought, secretly, that the biggest mistake Australia ever made was abandoning the White Australia Policy…didn’t think there would be anyone who agreed with me. Tis a good thing to know. More people have that opinion than our so-called betters realise. New Zealand Immigration records are publicly available on an XLS spreadsheet. Analysis shows that the skill requirement is missing from immigrants. About 30% only of net immigrant intake have work Visas. This is contrary to expressed policy of high skill immigration policy. Our previous PM slackjaw John Key was a liberal meaningless wimp like your Turnbull. Immigrants were used to ” raise the National GDP” for God’s sake. We also have a problem of “”Co-Governance”” with half Maori tribal leaders , who think they own the land, air and water. Older men who know what they are doing, and willing to shoot regressives apply here. “Analysis shows that the skill requirement is missing from immigrants. Yes. Most of these numbers are either returning Kiwis or students. Note that even someone like Peter Thiel would show up as an immigrant without a work visa. “We also have a problem of “”Co-Governance”” with half Maori tribal leaders , who think they own the land, air and water. To a degree, they do. And they have a contract that says so. This isn’t a major problem, it can always be resolved with Koha. David Moore you do trip over yourself. The 30% refers to foreign net immigrants . Check the stats. The Waitangi document is a very simple read David , Maori ceded sovereignty. I could spell it out for you, but you can read what you want to see. Antyway there are no real Maoris left in New Zealand. Immigration of Asian and other people will sort the problem out by nubers. Asians are not interested in the race based privilege policy. 30% Returning Kiwis & Aussies. I’m another who thinks the white-Australia policy should have been kept in place. When I walk through Melbourne and the vast majority of faces are foreign I feel a rising anger and hatred towards the ‘elites’ who have essentially sold out our culture to being replaced with that of asia. I’d have no problem at all with expelling every foreign born person from Australia and trying to fix things from there. Hmm…. keep that comment in mind should you or a loved one need a neurosurgeon. MAKE SURE to eschew the neurosurgeon, and have the surgery carried out by an out-of-work Australian, perhaps a teenager. Did you know, I was going to drop the neurosurgeon caveat in there but I got lazy. The 457 visas in the fast food game are for store managers. A store with 65 staff, all needing keeping on track & organised for a turnover of say $6 million, is indisputably a very skilled job. Dutton says “employ Australian teenagers instead”. This is weapons-grade stupid, and demonstrates just how out of touch with business & commercial reality our governing class actually are. To say that we need to bring in overseas specialists to run a store with 65 staff is patently ridiculous. I’m beginning to think you haven’t run one. Your beliefs on employer nominated visas are written as if you’ve not much involvement with them. Have a go at hiring a Chef, or a Toyota mechanic, beyond the black stump. Those visas are an expensive and time consuming process for the employer, if there was an alternative (apart from shut the business) that alternative would be pursued. I have some idea, I’ve sponsored somewhere between 40 and 60 overseas staff. Morons like Dutton & Shorten say I should have “hired Aussie teenagers” – The stupid, so strong it burns! I’m beginning to think that you’re making a fair number of false assumptions. I used to run large restaurants where the number of staff easily covered the numbers you’re talking about. I also owned and ran my own nightclub for four years. But what if I had not? Does that mean that my opinion is irrelevant? If this were a discussion about a used car dealership of which I have no experience would I then be forced to silence? That is no way to attempt to have a discussion, as you well know. But not only that, as my first ever job was at McDonalds and I had it for a few years, I have first hand knowledge of how someone was found to run the store, seeing as they don’t run themselves. The person usually would be a bright young individual who started at the bottom, became a duty manager and eventually reached the position of store manager. In other words, the store owners and management made an active effort to find, train, and promote staff. Also, the job itself is not particularly challenging once you get a handle on it. To say otherwise is ludicrous. I have hired a number of chefs in my time. Finding good people is always difficult. But using that as an excuse to bring in foreign workers merely subverts the free enterprise system by undermining the worth of those individuals within Australia who have obtained the skills necessary to do such a job. Those visas may indeed be both expensive and time consuming but in comparison to finding and keeping good staff I think that they might be somewhat of a softer option. That you have had to sponsor between 40 and 60 overseas workers I find unfortunate. I wonder how difficult it would be for you to find locals if the government wasn’t smothering the lower classes with welfare. I suspect that you would have an easier time of it. Like my original employer did back in the late 80s.